Cameo by 2000AD Online message boarder Endjinn in episode 2, James Mackay in episode 4 & 5, and Will Cooling block in episode 4. Text article. Second part titled "Tsars in his Eyes". 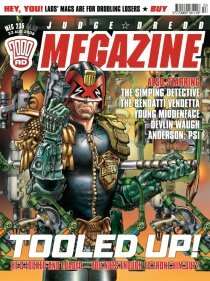 Third part titled "The New Avengers"
Text synopses of Judge Dredd's early stories (progs 2-328), plus 9 stories from other publications. Not in Megazine 232, 234, 237, 238, 239, 240, 241, 242, 243, 244, 245, 246, 247, 248, 249, 250, 251, 252, 253. First published in 5 segments in the Metro newspaper, 2004.